Website Design Churches Ministries NC | This legacy house of worship website was developed for online Branding and to generate online ministry inquiries and supports the existing church members. VISIONEFX has a long history of website design for churches and ministries. Our team understands the complexities of ministry brand and congregation growth marketing. Mt. Olive Missionary website was design in classic ASP for Windows IIS hosting server. Mt. 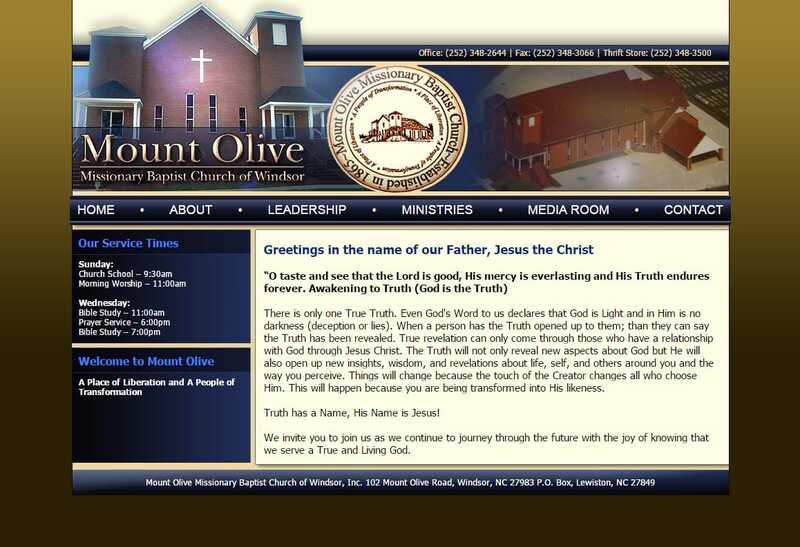 Olive Missionary is based in Windsor, North Carolina. VISIONEFX, a Web design company based in Virginia provides services to ministries and business in North Carolina. We service small to medium businesses throughout the United States. We want our customers to understand there are 5 Reasons Your Web Design Success is Our Success. Most of our customers are repeat customers. They return year after year to expand their websites. When looking for Website Design for Churches, Ministries contact the professionals at VISIONEFX. VISIONEFX also provides custom web design, web development, E-commerce web design, Word Press web design, Joomla web development, SEO and web maintenance services. Call: (757) 619-6456 or email info@visionefx.net.